Classic bowling lanes, indoor bocce courts, fire pits, great food, killer drinks – all under one roof. Guests will especially love the Chef’s homemade marshmallows and the grilled tenderloin sliders. Perfect for teambuilding events and opening/closing receptions. At-a-glance information: banquet seating for 300 in the ballroom and space for 1,200 across the entire 2-floor venue, 8 bowling lanes and 10 bocce courts, extensive food and beverage menu, and complimentary parking. Description Pinstripes offers scratch Italian American Cuisine in an upscale venue complete with enclosed patio that offer retractable glass walls, firepits, craft cocktails and of course bowling and bocce! 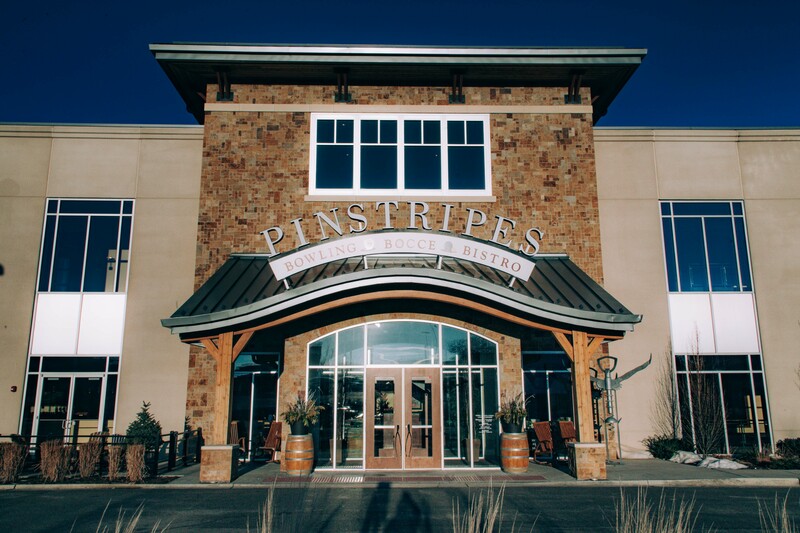 Space Notes Pinstripes has a ballroom that can be segmented for multiple groups or opened up for seating a single group of up to 300. We also offer two more intimately sized rooms on the main level for groups of 20-30 or combined for 50 guests. Have a larger group, or prefer exclusivity, how about a semi-private or full venue buyout? Then Pinstripes can support groups of up to 1500.